My elementary school had a huge library. There were shelves lining the walls filled with thousands of novels and reference books and encyclopedias. We had an hour each week to choose two new books, which we were allowed to sign out for the week. I remember spending indoor recesses sitting on the carpeted floor devouring book after book, and getting special permission from my teacher to sign out extra books. I loved to read, and that school library was my favourite room in the school. My classrooms were also lined with more shelves of textbooks, and maps and dictionaries. We had more novels, and more encyclopedias. Hundreds of books were at our fingertips, whenever we wanted. 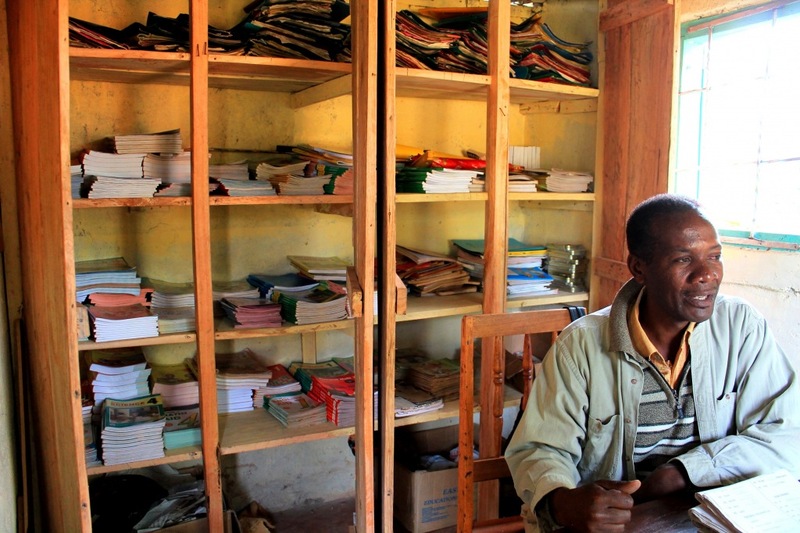 At Good Sheppard School in Kiritu, Kenya, they didn’t have a library. They had a few battered textbooks, and the teachers would copy the text onto the blackboard and the students would write their homework into their notebooks. 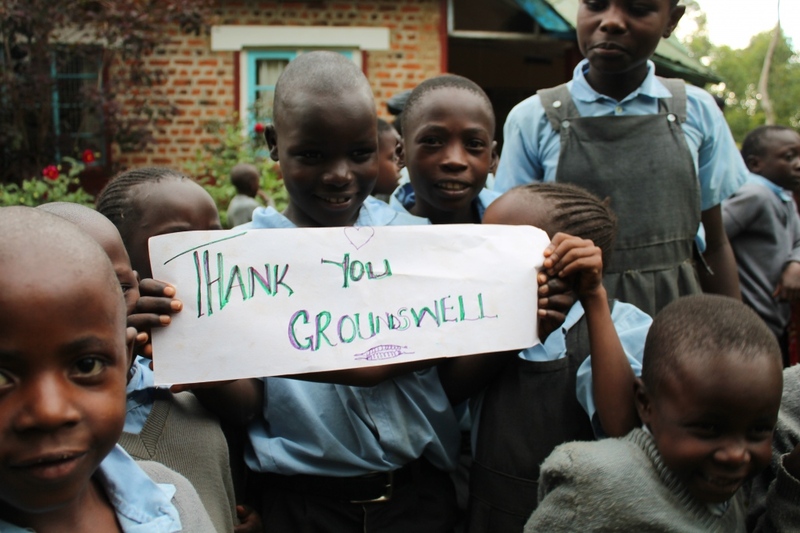 Last month, Operation Groundswell sponsored the purchase of over $2,000 worth of books. The teachers compiled a list of the materials they needed, and we used our fundraising dollars to go to the publisher in Mbale and buy them. We bought encyclopedias, and atlases, dictionaries, novels, textbooks, and more novels. They sang their gratitude to us in an hour long outdoor ceremony. It didn’t matter that the rain was just about to burst out of the sky, they had written a song, and they couldn’t wait to sing it for us. Mr. Ahuga, the dear director of Good Sheppard School. A month later, we returned to the Good Sheppard school. We met with Andrew Ahuga, the director of the school, and the rest of the teachers outside after the weekly morning assembly. “Since the books were purchased, there have been great improvements with the students.” Said Eunice Ahuga, the academic administrator of the school. “Before, children in class 1 would have trouble with numbers, and sounds and letters. Now they have no problems, and even children in nursery are learning to read small words.” “In other schools, even children in class 3 are making more mistakes than our children.” Added another teacher. The books were locked up in a newly built cupboard in the Director’s office. They are counted each week to ensure that none have gone missing. When a teacher wants to use them, they sign them out, and then sign them back in at the end of the day. They are not letting the children take the books home, though, for fear of them getting lost or damaged. There aren’t enough books for each child to have its own, but it is a start. An incredible start. Many of the children are unable to purchase their own. “It makes our job so much easier. We no longer have to deal with writing everything down on the blackboard.” Wycleff teaches class 5. “They are learning to love reading like I do, and even the parents are starting to buy more books.” Original blog post on of Sandwiches and Suitcases.